Can’t thank you enough for capturing a memory for us to share for a lifetime! Sandy and Odysseas are wonderful wedding photographers! The moment we met them at our villa, we knew they would be the perfect ones. They made our family feel so relaxed and at ease, which helped make our photos look so natural. Because they both were able to take photos, I felt as if they were able to capture every special moment - each from a different angle. They were there from the time I was getting ready to the time we all sat down for dinner, catching every moment they could that would be a wonderful reflection and memory of our special day. Justin and I can’t thank you enough for capturing a memory for us to share for a lifetime! We adored working with Sandy and Odysseas! It was critical for us to have a fantastic photographer as we eloped and had no other way to preserve the memories or share them with our family and friends. Sandy & Odysseas were so sweet and made our big day that much more special with their kind nature. When we got our pictures back I was stunned by how beautifully they captured the emotion and experience of our big day. I was truly blown away. Every single photograph was a work of art...the pictures are everywhere in our house because we couldn't narrow down our favorites. I wouldn't change a thing about our wedding day, especially the pictures. Working with Sandy & Odysseas has been an absolute pleasure and I couldn't recommend them enough. They are a couple themselves, which means they know what to say and do to make you feel comfortable within your own skin. My husband hates getting photographed, but Odysseas's light humor and positive attitude relaxed him and he not only agreed to have pictures taken of him alone, but also stoically lasted 2 hours when we were doing a photoshoot. Sandy has impeccable taste and she composed beautiful pictures where we look absolutely gorgeous, I wish I looked like this all the time! They are a great team that just work seamlessly together. They helped us schedule our day's timeline for the perfect lighting and we couldn't be more grateful for their tips and tricks. Extra bonus is that all of the communication is online, so it's easy to sign contracts, transfer money and get your pictures, which we got just over 1 month after the wedding, some people wait for months, if not years! I can't stress enough how important it is to have good pictures at your wedding, because it's the only thing that is left to remind you of your big day and if I had to organize our wedding again, without a doubt I'd pick Sandy & Odysseas again to capture our wedding! Together they make the perfect team! We literally cannot thank Sandy and Odysseas enough. Two ridiculously talented individuals, who together make the perfect team. All our family and friends are in awe of our wedding photographs and their attention to detail is unparalleled. Our photos are so light and natural. We truly adore them..
A beautiful couple who capture beautiful moments perfectly! Sandy & Odysseas made both me and my camera shy groom at ease throughout the whole experience. Both of us felt slightly uncomfortable having our photo taken and wanted as many natural photos as possible. Sandy & Odysseas made us feel relaxed and confident so that we enjoyed every second of our portraits. 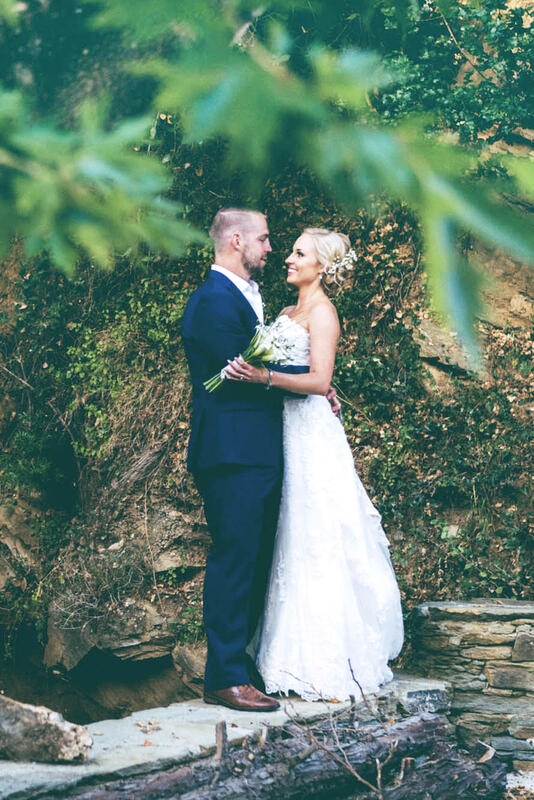 We will never tire of looking through our photos, as it’s like reliving our day all over again. Sandy & Odysseas not only captured our happiness but all of our guests. One of the best decisions we made for our wedding, was to have Sandy and Odysseas as our wedding photographers. Their passion for their work and dedication to making our wedding photos the best they could possibly be was unbeatable. So thankful for the beautiful visions they had in mind, as you only have one chance to make these special photos the best and most memorable they can be to capture your day. Not to mention, they are such a lovely couple and so much fun to be around!!! Sandy and Odysseas were the most perfect wedding photographers we could have asked for! From the moment we met them we felt so relaxed and comfortable and could tell they were beautiful people inside and out. We had a photo shoot a few days before the wedding at Little Venice in Mykonos town. It was fun to do yet very chilled and gave us a real flavor for what it would be like to have both Sandy and Odysseas with us on our special day. They captured every special moment with such romance from my shoes, earrings to the views and guests. Every detail was captured. They told us they would be invisible during our reception and they really were!! Enabling them to capture these spontaneous moments. They were wonderful conspirators in keeping my secret ! On a holiday to Santorini, I planned to propose. Sandy & Odysseas helped me plan and capture the moment. They picked several beautiful spots, including the location where I knelt down on one knee and proposed. Sandy and Odysseas were wonderful conspirators in keeping my secret and truly surprising my fiancée. Couldn't have done it without them. Highly recommended. Sandy and Odysseas where very friendly as well as professional. You could really feel they know their business as well as the best spots for pictures. In the end the results of the photos were amazing. I could seriously recommend both of them! Sandy & Odysseas caught and framed with their timeless vision many moments like these in our wedding. Their photographs became memories and those memories turned into life for us (recalling your wedding day as a “happy blur”, there’s a reason why this is such a cliché). Sandy & Odysseas are amazing professionals with a positive vibe such as the people you need by your side on a special day like this. We are extremely thankful for their existence on our wedding! Hugs & kisses! Tom and I looked at many portfolios online, including foreign photographers with the intention of flying them to Greece however no photos took our eye like Sandy and Odysseas! Our wedding day was the best day of our lives and we now have the best memory to hold forever – our photos! Sandy and Odysseas did an exceptional job and fulfilled and surpassed all of our expectations! Not only do we have the most beautiful photos, we also made two new friends! The professionalism and attention to detail was like nothing I’d ever witnessed! I saw their work and immediately wanted them as our wedding photographers. They were fantastic! The professionalism and attention to detail was like nothing I’d ever witnessed. They went over and above us. This couple are beautiful people inside and out! A real pleasure to have them as part of our day! Our wedding photos are amazing! The best photos I’ve ever seen of Matt and I, I don’t know how Sandy and Odysseas done it! I would recommend to anyone.. and I have! You would be lucky to have these two beautiful people share your wedding day and have the photos to remember forever! More than photographers, now friends for life! Sandy and Odysseas provided a very professional service. They managed to capture some incredible images we will cherish forever. I would encourage anyone looking for the perfect wedding shots to contact Sandy & Odysseas. Sandy and Odysseas are true magicians! They have captured the beauty of our special day with delicacy and passion. They made us feel gorgeous and the pictures are the most precious memory! They are real professionals until the last detail - communication, preparation, shooting and delivery of stunning results. You can be sure that your memories are in the best hands. Professional, Fun, Dedicated, and high end quality product. We consider ourselves truly blessed to have had the privilege of working with someone who translated our vision with such style, fun and professionalism. Our most special day wouldn't have been the same without Sandy and Odysseas. Best Decision and Invaluable Service!